How to charge a BMW i3 with DriveNow Helsinki - earn driving minutes! Charging the electric BMW i3 is easy and free. All you need is the charging card that's kept in the central armrest and the charging cable that's kept in the boot. The cockpit display will show you all available charging points under "Special points of interest". You can also locate the charging points using the app. Hold the charging card in front of the reader on the charging point and plug the cable into the socket. Then plug the cable into the car. A blue light around the socket on the BMW i3 flashes to signify that the car is currently charging. Check that also the light in the charging point turns blue. 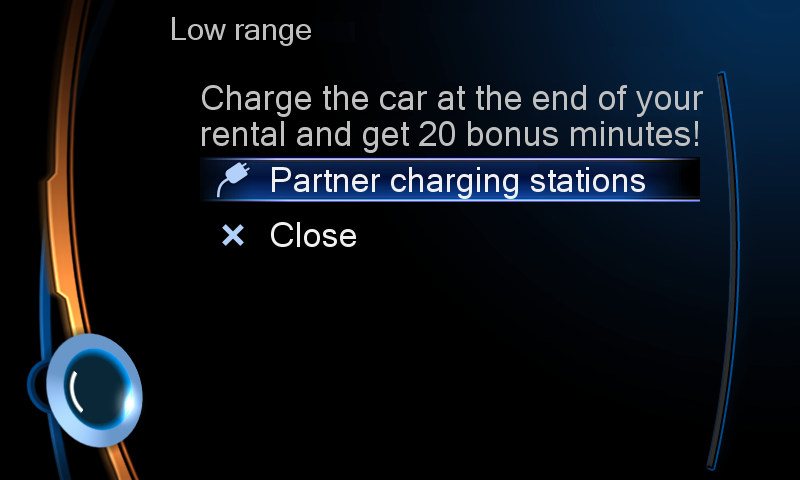 Tip: When the battery of the BMW i3 falls below 25% and you charge the car at the end of your journey, we will reward you with 20 minutes of free driving! Next driver: Take the charging card from the central armrest and show it to the charging point. Unplug the cable from the car, before unplugging it from the charging point. Enjoy the drive!